Tucked away above Zion's popular main canyon, Behunin Canyon is a majestic hanging canyon that cuts through the White Cliffs formations from the upper plateau down into the Emerald Pools pantheon. Hikers along the West Rim Trail can get a glimpse down into the impressive canyon as the trail starts its steep switchbacks down off of Horse Pasture Plateau. While Behunin Canyon doesn't have any classic narrow slot sections that Zion is famous for, a descent of Behunin Canyon makes for a fun canyoneering adventure through beautiful remote canyon scenery. Several big-wall rappels make this a more serious and intimidating affair than the more popular canyoneering routes, and the final 170-foot free-hanging rappel out of the canyon is definitely attention-grabbing. WARNING: This route is not suitable for hikers who have no technical canyoneering experience. 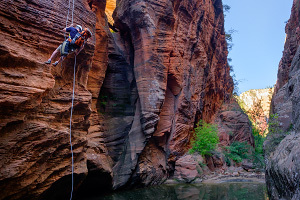 Like all other technical canyons in Zion National Park, you need a canyoneering permit for each member of your group. The National Park Service limits Behunin Canyon access to only 28 people a day and a group size of 6. 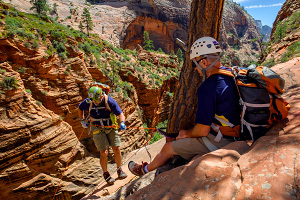 Complete info on the Zion Canyoneering Permits website. Elevation Change: 2000-ft ascent up the West Rim Trail and 2000-ft back down Behunin Canyon. Technical Challenges: Navigation to enter the canyon, numerous big-wall rappels (including the final long free rappel), downclimbing obstacles, and possibly a few short pools to wade/swim through. Longest rap: 170 feet. Equipment Needed: Enough rope for a 170' rappel (preferably two 200' ropes), climbing harness and rap device, climbing helmet, webbing and rapid links, GPS (to confirm start of canyon), slings or daisy chain as a safety leash at rap stations, two-way radios may be useful for communication at a few of the longer rappels. Seasons: Late spring through fall, although summer can be very hot in this open canyon. IMPORTANT DISCLAIMER: The guide below assumes that you have the basic skills required to descend a canyon safely. Conditions in canyons change quite often, so use your own eyes to evaluate every obstacle if something is different than expected. Do not blindly follow this or any other description; use your own judgement and be safe. From the saddle, carefully hike down the sloping sandstone shelf, sticking to the right which will take you all the way down to the canyon floor near the head of the canyon. Once at the floor of the canyon, a few trails-of-use lead the way through the vegetated upper canyon. In several spots, hiking up on the left/west slickrock slopes offers easier travel than the lower overgrown canyon floor. While this section of canyon is mostly dry, depending on conditions, there many be a few short, shallow pools to either walk through or scramble around. At any drop that appears too difficult to negotiate, look for a bypass on the left. After about .8 miles of hiking in the bush, the canyon abruptly turns left (east) and opens up, revealing the next larger section of canyon. Now the fun begins! Four big-wall rappels in a row will take us to the bottom of the next bigger section of Behunin Canyon. 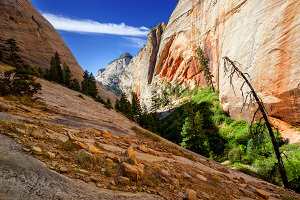 Hike to the lip of the first large drop and then look to the low-angle sloping wall on the left and follow a narrow ledge to the first two-bolt anchor in the rock. The approach to the anchor may seem a bit intimidating, but it is perfectly reasonable. (Many years ago, the anchor used to be on the right side of the canyon, but thank you, Tom Jones, for the better anchor on the left.) Rappel 1 (95 feet) is an easy walk backwards down the slope to the slickrock bowl below. Just behind you is Rappel 2 (180 feet) off of a large ponderosa pine down more angled slabs to a smaller ponderosa pine at the edge of the rollover. (You can see the lonely smaller pine from the start of the rap.) When the area is wet, stay on rope until you are leashed into the tree as the rock near the edge can be very slippery. Rappel 3 (150 feet) off of the small ponderosa is much more vertical going over the lip and then straight down the wall to a small bowl/ledge roughly 110 feet above the canyon floor. Rappel 4 (110 feet) is off of two bolts near the edge of the bowl all the way down to the floor of the canyon. (Yes, a doubled-over 200-ft rope really is too short for this rap.) Once at the bottom, pack up the ropes for now. The next section is very scenic as you hike through the sandy open canyon past several beautifully-sculpted potholes. 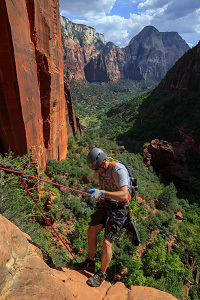 Within minutes, we reach Rappel 5 (90 feet) at a large domed slab. Look for two bolts on the right in the rock floor. (While getting on this rappel is pretty straightforward, several people have fallen at this spot over the past few years by misjudging how steep the slab gets.) At the bottom of this rappel is a beautiful narrow stretch of canyon with beautiful tall walls--the only spot in Behunin Canyon that resembles a classic slot canyon. The floor is mostly sand, but you may encounter a few pools, depending on recent rains. After .3 miles, the canyon turns left (east) and heads down a narrow 50-foot chute into the next lower section of canyon. People used to rappel off a log down through the chute into the pool below, but with the rotten log now gone, an alternative rappel station is located in the woods above the RDC (right down-canyon) side of the canyon. Look for a small trail-of-use that heads up into the woods above the canyon floor and follow it to the ponderosa near the cliff's edge. Rappel 6 (70 feet) heads straight down and lands you in a pool just next to the chute. The pool is typically waist-deep, but recent rains could turn this into a short swim. At this point, while the canyon continues south, you can look north to see the upper portion of the larger fork of Behunin Canyon. Continuing down-canyon through scenery reminiscent of Hidden Canyon, you will then reach a 15-foot cliff above a pool of water. When logs were present, this made the awkward downclimb easier, but there is a trail-of-use bypass RDC up the shelf system that leads to a short 12-foot rappel off a bolt. Continue down canyon past some larger potholes that can be bypassed by hiking up the left side wall soon enough you will come to Rappel 7 (90 feet), a more complex two-stage rappel off of two bolts RDC in the wall just above the drop. The first stage of the rappel lands at a small pothole; stay RDC and walk around the pool. The second stage of the rappel will land you in a much larger pool. To avoid the deepest section of water, as you start the second stage, head LDC over and down a smooth wall (with groove marks) to land in the other side of the pool. Climb out the other side and then pull the rope. At the exit of this "room", you can avoid the next pool by walking a narrow shelf above the water; this shelf is just narrow enough to make things awkward, so you may need to take your pack off. The final rappel has two sets of bolts: an older set with chains that you can clip into for safety and the newer set of bolts facing out. Rappel 9 (170 feet)--this is the rap of the day. As you walk backwards on rappel, you will be touching the wall for the first 20 feet or so, then it's all a hanging free rappel. If you're nervous, this experience may make you rethink your life; if you're calm, you will enjoy the absolutely amazing views of the hanging gardens and the Emerald Pools pantheon in the distance. Once you land on solid ground, breathe a sigh of relief. Once you have pulled your ropes and have packed up your gear, navigate the boulderfield down the watercourse. Soon enough you will hit beautiful running water and you will bump into tourists hiking the Emerald Pools Trail. Follow the Lower Emerald Pools Trail out to the Zion Lodge or the Kayenta Trail back to the Grotto. Behunin Canyon has several rappels where it's very difficult for people to communicate between the top and the bottom. Small two-way radios can be very useful, especially at rappels 3, 7, 8, and 9. Some of the rappels are notorious for getting ropes stuck or crossed, especially rappels 3 and 8. It's useful for the second-to-last person down to test the pull so the last person can make any adjustments as necessary. Behunin Canyon is a great canyon! It might not be as stunning or classic as the likes of Pine Creek or the Subway, but offers up some beautiful scenery through many diverse sections of canyon. Several of the longer drops really get your attention, so make sure you're prepared and you know how to add friction to your device while on rappel.